The infantry division was commanded by a major or a brigadier general and composed of two to four infantry brigades. 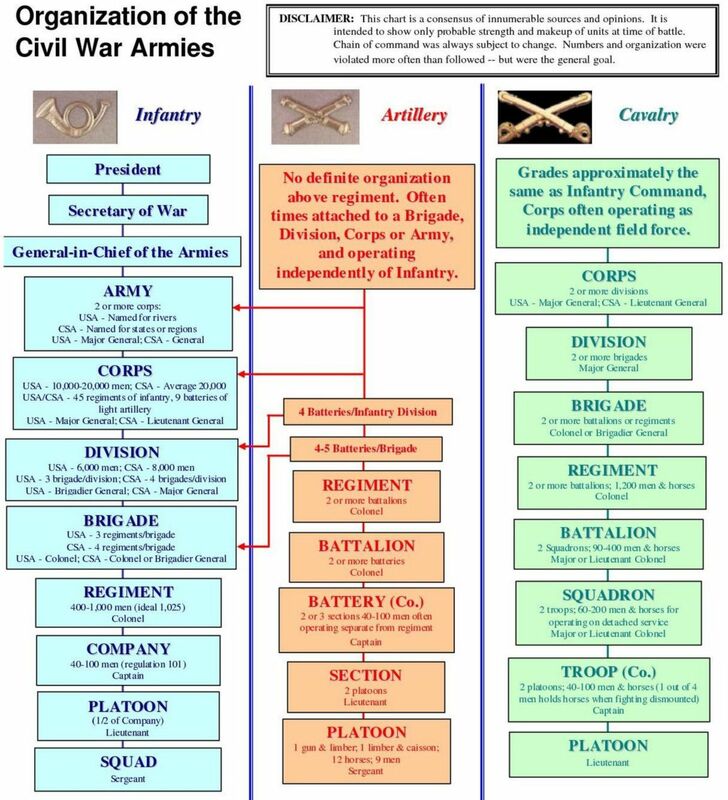 The brigade, commanded by a brigadier general, was composed of four to six regiments, and was the primary organization used by commanders in battle (see American Civil War Infantry Organization). A brigade with good officers and good training was a formidable fighting force and often advanced or defended positions in cooperation with fellow brigades. It was common practice for a brigade commander to send forward most of his regiments and hold one in reserve. The Confederate War Department made attempts to have brigades composed of regiments from one singular state or state affiliation, such as General Joseph Kershaw's brigade composed of all South Carolina regiments. The Union Army did not always make such conscious choices, though there were some brigades which acquired interesting nick names due to their ethnic origin or locality from which they hailed. For the infantryman, the regiment was the most important unit. Led by a colonel, lt. colonel and major, a full strength regiment numbered over 1,000 officers and men. Attrition due to disease and battle losses meant considerably lower personnel in each regiment by the time of the Battle of Gettysburg, where some regiments mustered only about two-hundred. A regiment was divided into ten companies of 100 men each at full strength. One company was divided in half as two platoons. One company was led by a captain with two lieutenants who each commanded a platoon. Platoons were divided into squads, led by a sergeant or corporal. Regiments fought in a "battle line" or in some cases a "skirmish line", which was a general open rank tactic used to feel out the strength of an enemy force. War Departments in the North and South issued regulations for how the army was to be organized in the field though commanders were also given the luxury of making changes in the organization as they saw fit. 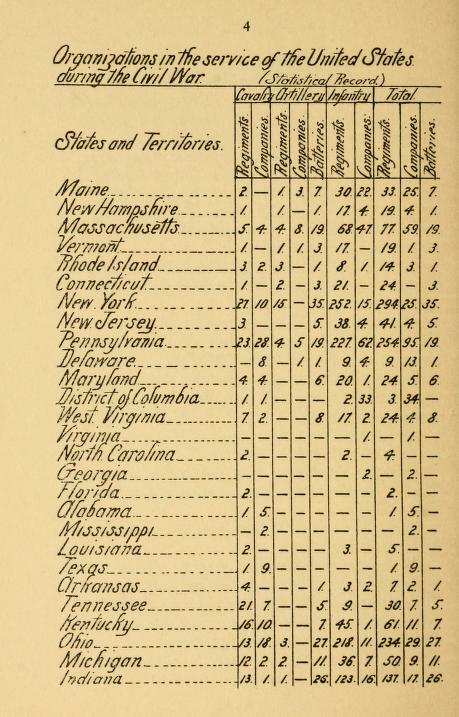 Thus there were often variances from the chart seen here especially in the Army of the Potomac, which lost regiments due to the expiration of their term of service or consolidated organizations due to battle-related attrition. Though the Union army's corps were each designated to have three divisions, the Third Corps and Twelfth Corps only had two divisions apiece at Gettysburg. Likewise, the Eleventh Corps' organization varied from the regulations having only two brigades in each of its three divisions. 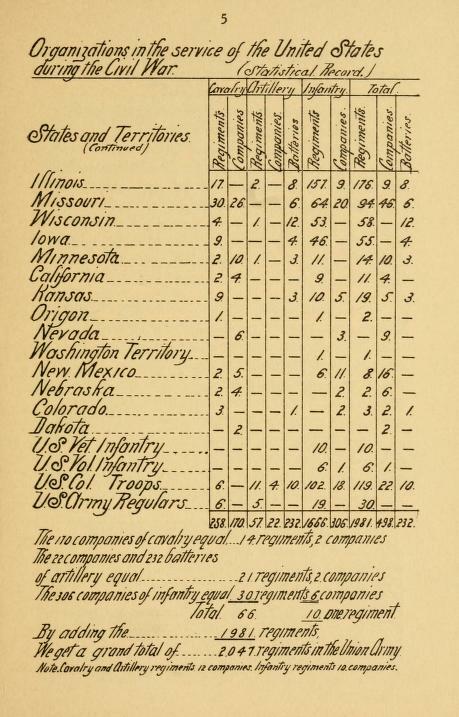 At the outbreak of the Civil War, there was a standing force of "regular" units in the United States Army. State militias were called into service, but there was a need to Federalize these units so that they could muster pay from the United States government and serve outside of state borders. Each state was given a quota of "volunteer regiments" to be raised for service lasting from three months to three years. The South faced a similar dilemma. Southern states raised and supplied the Confederate armies with volunteer regiments. By 1863, many of the regiments in both armies had been in service since 1861 and were still composed of mostly volunteer soldiers, though the first "conscripts" or men required by state law to serve in the military defense of a state, had begun to appear in Southern units. A regiment's flag, or "regimental colors", were painted with the regiment's number and state affiliation, usually followed by "VOLUNTEER INFANTRY". The term volunteer was a symbol of pride for soldiers on both sides. The most widely used manual for small units (regiments) was Rifle and Light Infantry Tactics For The Exercise and Maneuvers of Troops When Acting As Light Infantry Or Riflemen, written by William J. Hardee. The manual specified the proper placement of officers, the rank and file, the manual of arms, basic marching orders, and other requirements. His manual was re-written for Confederate use in 1861 when Hardee resigned his commission from the United States Army and joined the Confederacy. Other manuals of organization and drill were used, but "Hardee's Tactics" continued to be the most popular and widely used manual throughout the war.